To many including I the Omni doesn't look natural to use. Could you please bring the Omni to a busy gym to record people's reactions and interactions with the device? You could probably push the Omni to it's limits with people who can run decently. Offer a robust version to withstand heavy abuse by strangers for business. Offer a more affordable version of the Omnifinity Omnideck. THAT looks natural, but it costs SIXTY THOUSAND DOLLARS. Feeling natural is important when you spend hours. Hi @strunberg, with the Omni you can indeed run as intensely as you're physically able to. The support enables you to accelerate and stop quickly and safely. The other ODT does not; you can see the user is walking pretty slowly. If he were to start sprinting he would run straight off the platform. That is not a style that works very well yet, despite its high cost. The Omni does feel extremely natural, despite being much more affordable. Many of the people who have tried it are also gym users (myself included) and they've all loved it. I would much prefer the Omni to a regular treadmill, even if I was only going in one direction. please bring the Omni to a busy gym to record people's reactions and interactions with the device? It's a good idea, I think that would make a great video! In terms of being robust, I agree that's very important. The Omni has undergone a number of revisions, some of which have been to reinforce its strength. The stress testing at various events has really helped forge the Omni into a solid device. 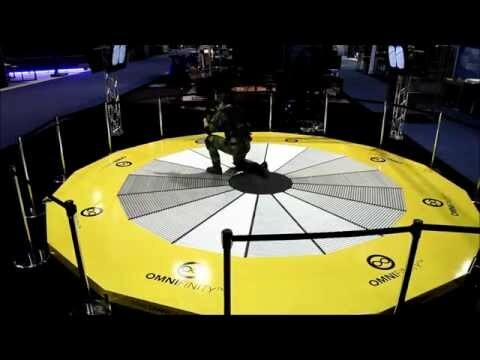 I just want to point out that the "omnideck" shown in that video looks like one of the most dangerous takes on the mobile platform I've ever seen. You're basically standing on a bunch of rollerbars that are all aimed generally towards the center, and you're attached to a rope that keeps pulling you back towards the center. If you noticed though, he's constantly walking around in a slow circle instead of changing direction, and when he's walking he's taking those tiny little stubby steps, because actually trying to use a natural stride would leave his feet swinging completely out from under him, with him swinging through the air or outright faceplanting, or both. That's not even getting into how dangerous it would be to try to walk back over that center point when you can't see it. One step you're have rollers to compensate for, the next step you have normal ground, whoops, step right after that has rollers again, maybe, unless you were at an angle, in which case the rollers might be moving at an angle. Seriously, that is scary to watch.